Listening to big-name investment gurus isn’t always worthwhile, but, one trade many bright lights nailed, at the end of 2009, was the long-dollar trade. A whole host of media names, like Marc Faber (see here on December 29) and Jim Rogers (see here on December 10) and others came out and said the dollar was oversold and due for a bounce. There were a lot of big-name analysts making the same call, and if you’d listened to them you’d have been in good shape on those trades today. In the coming days, expect to start hearing a lot of the opposite. Greek bond spreads are narrowing. There’s a good chance the EU can paper over its problems for a while longer. Meanwhile, the euro has been a sea of red basically since the beginning of the year. 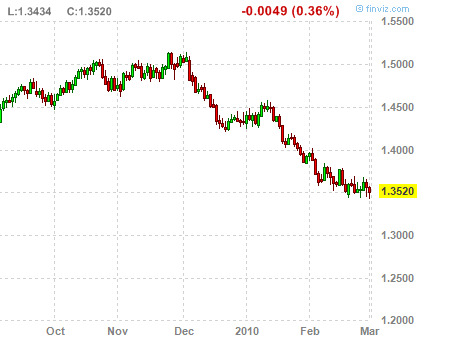 Yesterday on Bloomberg Faber said the euro was oversold. He won’t be the last. Everyone will include caveats about how it’s just a trade and how the euro has serious structural problems (just like they said when they announced the dollar bullishness).